World Wide Appliance Service Co offers highly competitive rates on all appliance repair services. All service call fees are waived with repairs. World Appliance Service Co is an appliance repair company that is passionate about meeting the need for an efficient and functional home. At World Appliance Service Co we built a reputation that is based on honesty, dependability, and knowledge. Over 90% of all our first-time customers become my valued repeat customers and recommend to friends and family. We are dedicated to delivering the best possible customer experience, as we understand that an appliance breakdown can be very inconvenient. Our technicians have experience with every major brand. 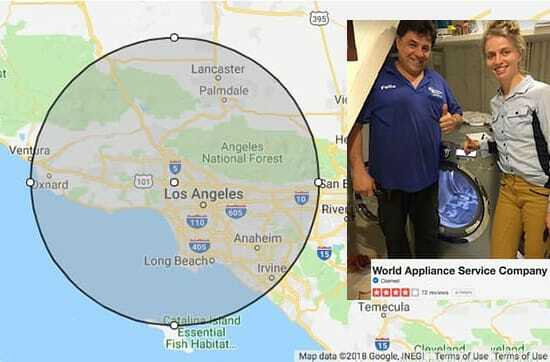 This is what makes us the best appliance repair in Los Angeles, San Fernando Valley, and surrounding areas. In most cases our techs are able to provide appliance repair service on the same day. Skillful factory trained and authorized technicians to ensure consistent, high quality service. All service call fees waived with repair or appliance service. A saving of $85! Ok so I wanna thank Felix for coming by and fixing my washer. He was prompt, professional and fixed the problem in no time. Totally knowledgeable fella and worth the money cause you know your getting a guy who knows his craft. Thanks Felix!! I couldn’t have asked for anything more. The service I received from Felix was fast, friendly and professional. Can’t thank you enough. I had an LG refrigerator fixed. Felix came to our house today to fix our washer. This is the second time we have used him for appliance repair. He diagnosed out problem and fixed it quickly. He has proven himself on both visits to be prompt, courteous, extremely capable and smart. He fit me oto his schedule within 24 hours. It’s a great relief to know we can depend on him for all our kitchen/washer/dryer issues. Highly recommended! Fantastic service – they confirmed their appointment, gave me a price before the day of the job, were on time (even early), and fixed my dishwasher without any issues. Further I was given advice on what type of dishwashing detergent I should be using (turns out the pods are really bad and you should only use liquid cascade!). He even took a look at my washer when I asked if he had any advice on how to maintain that too! So nice, professional and did a great job!